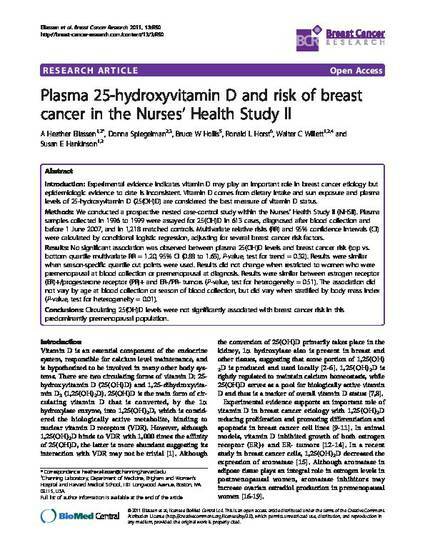 Introduction Experimental evidence indicates vitamin D may play an important role in breast cancer etiology but epidemiologic evidence to date is inconsistent. Vitamin D comes from dietary intake and sun exposure and plasma levels of 25-hydroxyvitamin D (25(OH)D) are considered the best measure of vitamin D status. Methods We conducted a prospective nested case-control study within the Nurses' Health Study II (NHSII). Plasma samples collected in 1996 to 1999 were assayed for 25(OH)D in 613 cases, diagnosed after blood collection and before 1 June 2007, and in 1,218 matched controls. Multivariate relative risks (RR) and 95% confidence intervals (CI) were calculated by conditional logistic regression, adjusting for several breast cancer risk factors. Results No significant association was observed between plasma 25(OH)D levels and breast cancer risk (top vs. bottom quartile multivariate RR = 1.20, 95% CI (0.88 to 1.63), P-value, test for trend = 0.32). Results were similar when season-specific quartile cut points were used. Results did not change when restricted to women who were premenopausal at blood collection or premenopausal at diagnosis. Results were similar between estrogen receptor (ER)+/progesterone receptor (PR)+ and ER-/PR- tumors (P-value, test for heterogeneity = 0.51). The association did not vary by age at blood collection or season of blood collection, but did vary when stratified by body mass index (P-value, test for heterogeneity = 0.01). Conclusions Circulating 25(OH)D levels were not significantly associated with breast cancer risk in this predominantly premenopausal population.